FREE English Conversation Books. 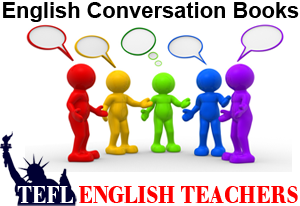 TEFL English Teachers offers 5 levels of conversation books. The 46 page teacher lesson plan uses the English only communicative approach to teach English as a foreign language. The English only lesson plan is designed to teach a 4 week – 20 day course. The curriculum presents 16 conversations on Monday – Thursday with an oral exam on Friday, followed by graduation on day 20. There is no homework for students to do at home. The TEFL English lesson plan documents every segment of the bell curve from the Day 1 Greeting through the Day 20 Graduation Ceremony. The bell curve format makes class room instruction easy to use and follow. TEFL English Teachers also offers conversation students and teacher books as well as 4 conversation oral exams.